I know I've been MIA lately. Grad school is done and graduation is on Mother's Day! And then 5 days later, I'm getting married!! 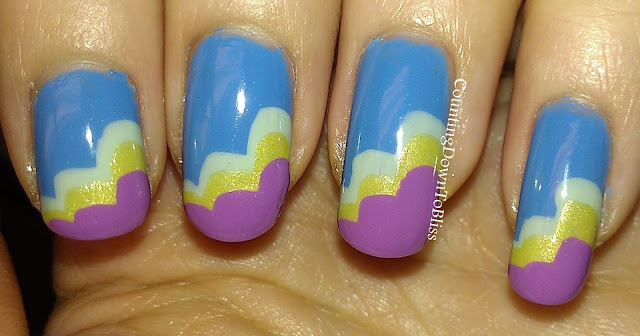 So, I've been a little busy, but I have been keeping up with my nail art just fine! I just wanted to show you all a few cloud nails I did. This manicure was created using an Enchanted Polish and 2 Sally Hansens. Clouds in My Coffee with Nail Art! About a month ago, I managed to purchase myself a mystery gift bag from Llarowe. Contained within this mystery bag of polishes was Pretty and Polished Clouds in My Coffee. I remember wanting this polish when it first came out. SO happy it was in that bag! 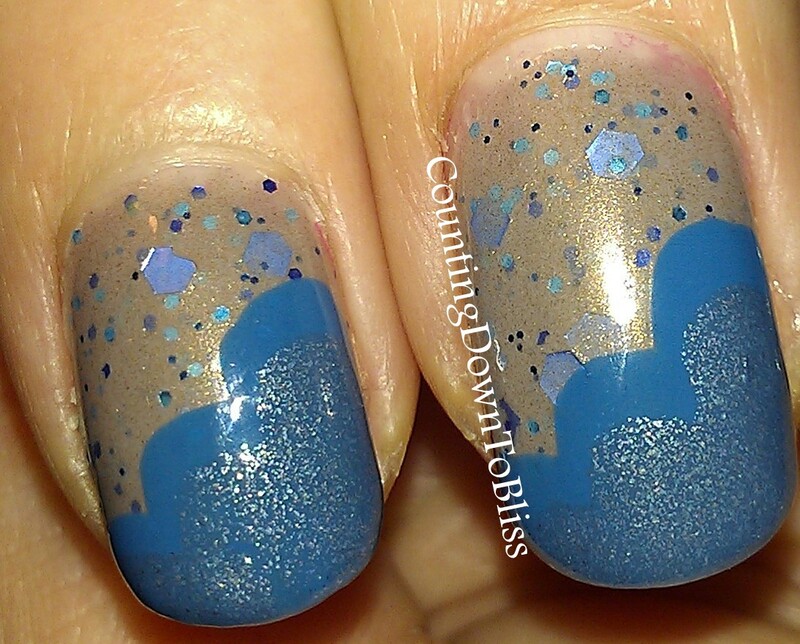 Clouds in My Coffee is a gorgeous light brown mocha with various sizes of glitter in a few different shades of blue. It's such a gorgeous combination! Shown is 3 coats with HK Girl topcoat. I wore it like this for a day and a half, and decided to do a little something extra to it! What better way than to keep with the theme of clouds and do the cloud technique! I used Zoya Breezi and Skylar to make it happen! I love this combination! I got quite a few ooohs and ahhs while meeting with wedding vendors this weekend. That always makes a gal happy! I broke down and got a Feburary Mystery Box from Julep. I got 6 really nice polishes and a lip gloss out of the deal. One of these polishes drew my attention right away. Julep Rose. It's an orange based red that in the right light, sort of takes on a bright watermelon color. It makes me think of sour gum and that makes me happy. For my birthday last month, my sister gave me an e.l.f. polish called Dream Maker and I thought it would be the perfect topper for Rose. All pictures show 3 coats of Julep Rose with 1 coat e.l.f. Dream Maker with topcoat. 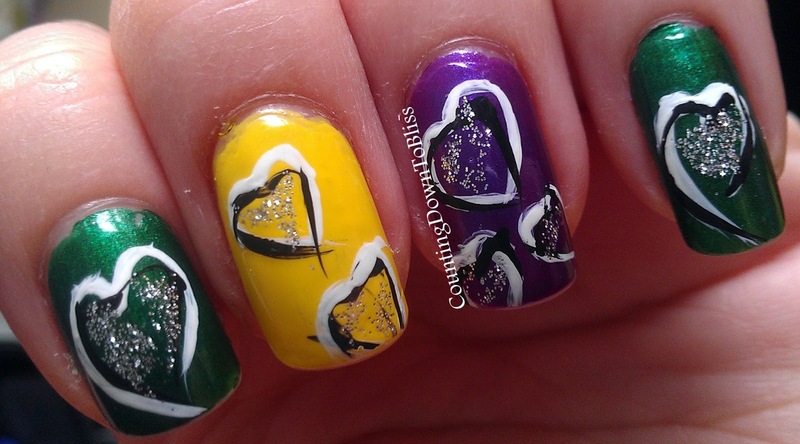 Mardi Gras and Valentine's Day! i had initially done a Valentine's Day design with pinks and mauves, and the pictures got deleted!!! I was so bummed!! I had to post something, so I quick did up a Mardi Gras and Valentine's Day manicure all rolled into one! I used Zoya Pippa and Holly, and Julep Morgan. I used some It's So Easy Striper brush for the designs and glitter. Look at the blue sparkle in Jennifer! I love it! Recently, I took the plunge and indulged in 365 Days of Color's Valentine's Day Bag. The week before these bags were available, I purchased some of her hand cream, cuticle cream, and miracle balm. I love them all. My cuticles are 90% better since using the hand cream and that's with only 3 days of continuous use. In the Valentine's Bag was this lovely limited edition nail polish called Crush on You. It's a light pink creme with pink and red round micro glitters. I don't even know where to start! This polish is, hands down, THE BEST Indie polish I have ever used. It wasn't gloopy and thick and the glitter didn't jut out all over the place on the nail. I didn't even need to use Gelous to smooth things out. Also, this polish lasted 4 days on my nails without tip wear. I'll definitely be trying out some more of her polishes soon! I had to use 4 coats to achieve the look you see below. It's a relatively sheer polish that builds easily to opacity. You can find 365 Days of Polish hand cream, polishes, cuticle oil, and miracle balm HERE. I've fallen behind!! I'm catching up now though!! This challenge was difficult for me. I couldn't figure out what to do! When I think winter solstice I think of celestial bodies and deeply rooted traditions. I wanted to channel that a little and thought what better way than to depict a night sky. I started with Zoya Storm as my background to serve as an inky sky full of stars. I then went in with my sponge and Sinful Colors Snow Me White and made the moon on each nail. I wanted it all to have a soft, uneven look. More wispy, if you will. I then went back in with my sponge and layered Zoya Harley, Zoya Carey, and Barielle U-Concrete-Me, making it look like clouds. This is the manicure I was rocking for a good portion of this week. I chose these colors with summer in mind! I used all Zoya polishes again. This time it is Trixie, Zuza, and Mitzi.